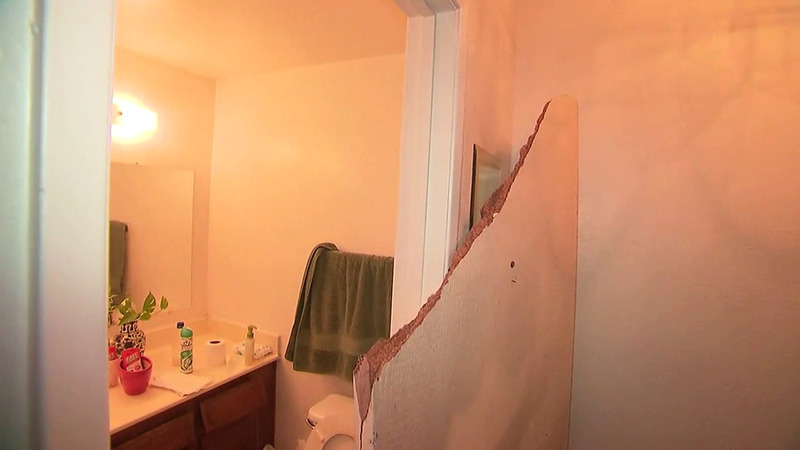 A look inside the home of the San Bernardino mass shooting suspects. REDLANDS, Calif. -- Reporters were given a look inside the Redlands home connected to the San Bernardino shooting suspects Friday morning. The landlord of the property, Doyle Miller, used a crowbar to pull back a wooden board placed in front of the door. Media members then entered the home, located in the 50 block of North Center Street. The door frame of the home was twisted and windows were busted out during overnight searches Thursday conducted by investigators with the FBI and local law enforcement agencies. The property was given back to the landlord once the searches were finished, according to FBI officials. Members of dozens of media outlets were given an inside look into the home connected to the San Bernardino shooting suspects. Toys, prayer books and packed suitcases were strewn about the living room floor and dozens of photos and personal documents were scattered in a bathroom, on a bed and in another room in the two-story unit. The overnight searches yielded a dozen pipe bombs as well as hundreds of tools for making more of the explosives, and over 3,000 more rounds of ammunition, authorities said. Authorities confirmed that Farook and Malik were listed on the home's rental agreement and the landlord said the couple had lived at the apartment unit since May. Miller said the couple seemed normal and did not cause any problems while they lived on the property. Redlands police, SWAT, FBI and other law enforcement agencies served a search warrant at the home Wednesday night. Robots were spotted going inside the location and explosions were heard going off as authorities surrounded the area. "It's really disheartening and scary because this little sleepy town," resident Faith Sanders said. "We don't have this kind of thing happen in our town." Click here for full coverage on the deadly mass shooting in San Bernardino.